Circles of gay men with AIDS would come together. Each man speaking with enormous glee about whom they had cut out of their lives that week. I myself just waiting for that time to come. Pete turning on me in a fury and cutting me out of his life. And to know that the final pleasure you are probably going to give someone is the giddy delight they will feel when they cut you out of their lives is pretty bizarre to say the least. And that knowledge is part of the peculiar numbness that set in that helped me deal with the tragedy we were inside of. Though the situations are not parallel this reminds me of the fate of many who from the outside fought to help liberate South Africa from apartheid, who have helped liberate East Timor from centuries of oppression only to see those places liberated into the hands of the IMF or the World Bank. At that point of viability we recede into irrelevance and possibly even become a danger to those states. We are easily discarded. 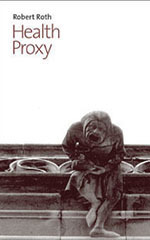 Robert Roth’s Health Proxy is a dynamic collage of consciousness—bits and pieces of perception, insight, observation, dialogue, interior monologue, commentary, tirade, always deeply personal, profoundly philosophical at times, wide-ranging in its concerns and themes, ever in touch with the particular, deep in its sympathy, resolutely free—or shall we say there’s a mighty struggle here to be free—of imperialist assumptions, hierarchical judgments. All of this makes it radically counter-cultural in its politics, a palpable extension of what we were all shaped by in the late 60s and early 70s. This is a record of Robert’s attention to the life around him and within him. In fact, his empathetic nature, fiercely driven by a love of life, justice and beauty, and a lust he can, fortunately, barely contain, helps us see our own world come vividly alive even as it is spinning slowly and irrevocably within a spiral of decay and death. The planet breathes in his notes and entries. We come alive in them—because of the attention he pays. Robert Roth serves up the artist in the Norman Mailer sense of heroic, against the odds, no cheap shots. Not a tepid salesman of the self, but one to expose the good the bad and the not so pretty. Robert Roth’s Health Proxy is a meditation and a provocation. These seemingly antithetical states of being propel this work and involve the reader in a personal journey that begins in the sixties and ends tomorrow…. [This] is a unique book, which has no readily comparable equivalent. Anyone who has experienced the oscillating trajectory of life in the last few decades will enjoy viewing their own life through the prism of Roth’s recreation of his. ROBERT ROTH is a writer who lives in New York City. He is co-creator of the magazine And Then.